SUPER VALU REMAINS Ireland’s most popular grocer by market share despite some strong growth by its closest rival Tesco. Analysis of the Irish supermarket sector by Kantar Worldpanel has found that Super Valu commanded 22.2% of total market in the 12 weeks to the middle of August. This puts the retailer marginally ahead of Tesco at 22% and Dunnes Stores at 21.1%. Lidl comes in fourth with 12% of the market with Aldi in fifth at 11.1%. 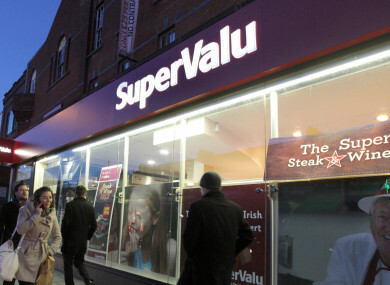 Despite remaining in the top spot, Super Valu is the only retailer to see its market share fall over the course of the year. Tesco has shown the strongest growth compared to last year having recorded four successive quarters of sales growth. This adds up to a growth in sales of 3.4% ahead of last year. Aldi achieved the same level of growth but their overall volume is smaller. In total, sales in Ireland’s grocery market grew by 2.2% over the year meaning that all five of the major retailers were able to boost sales volume. Drilling down into the figures, David Berry of Kantar explained that Dunnes has managed to increase its overall volume of sales despite losing some customers. “The number of households shopping with the retailer has fallen from 64% to 59%, that’s a reduction of 68,000 in absolute terms,” Berry said. However, this decline in footfall is cancelled out by a healthy improvement in how much shoppers are spending. The average Dunnes basket now includes an additional item and is worth an extra €2, suggesting that it’s performing well in the larger ‘main shop’ of the week and less so among smaller top-up trips. Email “Super Valu is clinging onto top spot in Ireland's battle of the supermarkets”. Feedback on “Super Valu is clinging onto top spot in Ireland's battle of the supermarkets”.